Behold, the beauty and the benefits of the Himalayan salt rock lamp. Once relegated to the mythical, magical, somewhat mysterious sector of home decor, like their cousin crystals, Himalayan salt rock lamps are an undeniable darling of decorating these days — their soft pink glow as hard to resist as their purported health benefits. While its trendiness in home decor took off a few years ago, pink salt has a history in natural medicine that dates back centuries, by some estimates. True Himalayan pink salt is mostly mined from the Khewra Salt Mines of Pakistan and is said to have been discovered by Alexander the Great’s horse. So how is a little light able to emit such magic? The jury is still out, honestly. Some salt rock lamp lovers tout the rosy mineral’s ability to "clear the air of electro-smog,” to reduce symptoms of mood disorders like seasonal affective disorder, and even help you sleep. 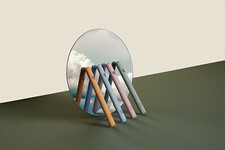 The lamps — made by hollowing out a hunk of pink salt and placing a wired bulb or tea light inside — are said to work in two ways: By attracting allergens and pollutants from the air to their surface, and by generating negative ions, which can counteract the effects of electromagnetic radiation from cell phones, microwaves, and computers. But, as TIME notes in the video below, the research to back up these potential benefits is scarce at best. It’s been said that of the 84 minerals believed to be traced in Himalayan salt, only 15 are known to play important roles in our bodies. Thankfully though, salt rock lamps’ aesthetic qualities can’t be argued, and these three decorating ideas prove it. Look for styles beyond the original raw crystal (like smoothed-out squares, spheres, and pyramids) for a modern look that’s fitting with any decor. 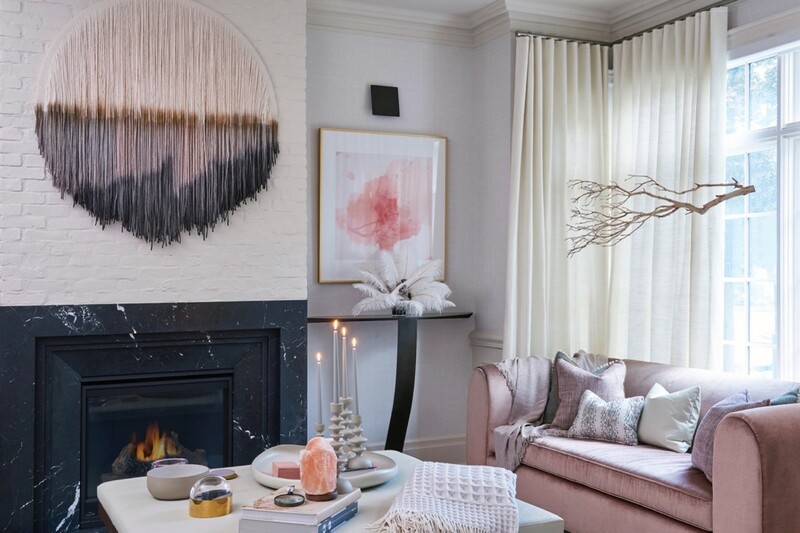 The family room of a Toronto home by designer Stacey Cohen is as eclectic as they come, anchored by a fringy wall tapestry by artist Lauren Williams, a floating driftwood branch, and Himalayan salt coffee table decor. It’s all in the details when keeping a room’s color palette neutral, and the shot of pink from the lamp and other blush-colored accessories keeps the otherwise black-and-white room from feeling too stark. But where there is a salt lamp, there will be dust, some say, since the negative ions released by the lamp attach themselves to particles in the air, causing them to become heavier and drop onto your surfaces. Be prepared to wipe down that coffee table often, if the lamp’s air-purifying powers do in fact prove to be true. Courtesy of Stacey Cohen Design. Pro Tip: Rougher salt lamps may reap greater benefits. Small amounts of water vapor circulating in the air can carry things like mold, bacteria, and allergens. Salt lamps are believed to attract this water vapor, cleaning the air in the process. Because rougher lamps have a higher surface area than smoother ones, they’re thought to have greater air-purifying potential. Salt rock lamps may not have a proven connection to good sleep (though studies have yet to be done, people say removing certain ions from the air can promote relaxation). But dim lighting does. In fact, bright light delays production of the sleep hormone melatonin. It stands to reason then that placing a salt rock lamp alongside your other nightstand decor could help create the kind of relaxing atmosphere you want to lull you to sleep. “The earthiness of Himalayan salt rock lamps lends them perfectly to Zen, nature-driven styles, like bohemian, global, and eclectic,” the designers at Wayfair note. 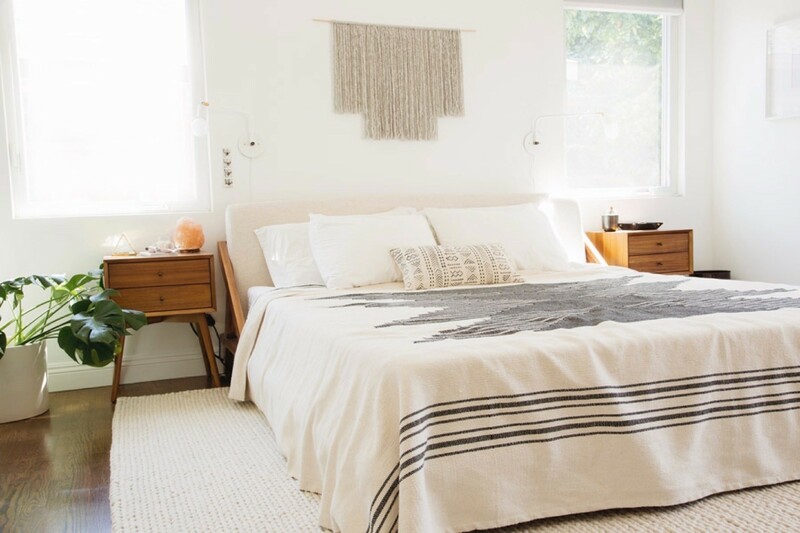 But on a bedside table inside a couple’s midcentury-inspired master bedroom, a pink-salt rock lamp feels equally fitting, adding both a layer of texture and color to the otherwise airy, white space. If this is your year to harness all the good vibes, consider converting your electronics charging station into a personal recharging station instead. Salt-lamp enthusiasts say electronics are the primary source of positive ions (which apparently have some not-so-positive effects on our well-being) and that the lamps hold the power to counteract that draining energy. Science aside, a dedicated space designed for reading, meditation, and other exercises in mindfulness can’t hurt your efforts to create balance and focus at home, and a salt rock lamp is one easy way to help set the mood. Use it as your primary source of light, like in the cozy nook below. Then fill out the space with some mood-boosting greenery, a fragrant candle, and a comfy perch to set yourself and your intentions on. Pro tip: Keep salt lamps away from precious furniture. When turned on, salt lamps generally stay dry enough that they don’t pose any risk to the furniture near where they’re placed. But in humid environments in particular, lamps that are left off may draw enough moisture out of the air to drip salty water onto the wooden base and any surface upon which it’s sitting. The result: Ring-stained furniture or wooden pieces that become eroded over time. 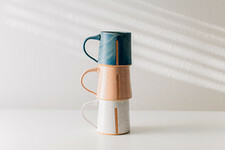 Another source of inspiration on how to integrate the Himalayan mineral into your mindfulness practice and into your decor? The salt therapy treatments on offer at spas across the globe. Inhaling dry, salty air particles is said to help improve the symptoms of asthma, allergies, and sinus congestion. A salt lamp helps create an equally spa-like vibe when placed in the bathroom at home. 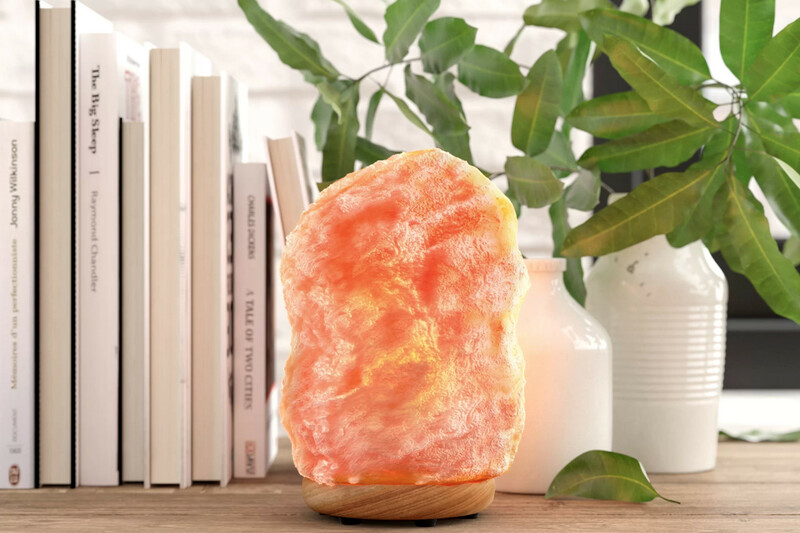 Just remember that a faux salt lamp won’t really do the trick, so keep an eye out for imposters (they’re generally brighter, harder to break, and less expensive), or stick to plants for their proven air-purifying qualities.